This piece was inspired by a visit to a few Pacific Ocean beaches in Mexico. 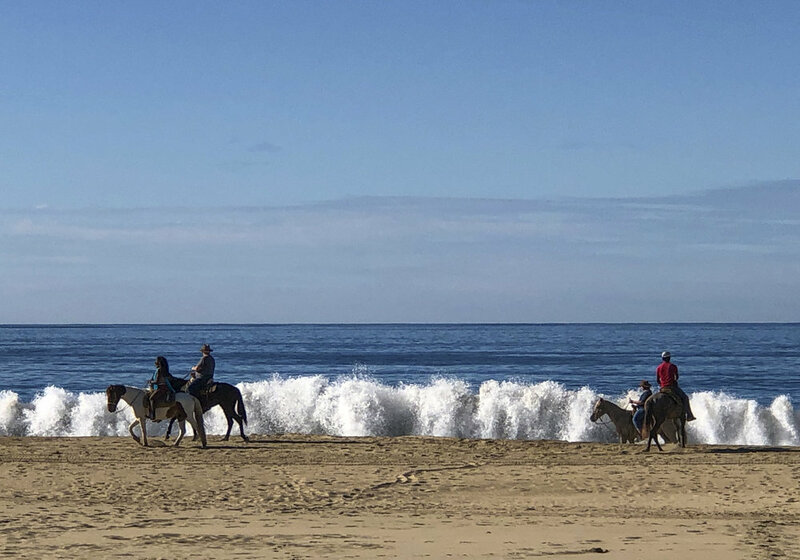 They include Zihuatanejo, Barra de Potosi and Troncones, a winter “Mecca” for folks from San Miguel de Allende and those fleeing the cold from the north. Framed by an azure sky and the ocean, the wide expanses of sand appear like a vast carpet encompassing soft, smooth, silky or grainy textures. The feel of the sand under our feet ranges from cool to burning hot. Strolling on an empty beach, particularly at sunrise offers a magical, peaceful experience. The rising sun transforms both the water and the sand into a glistening environment where the shallow water on the shore reflects the sky’s ever changing colors and patterns. The sound of the waves, the hint of mist above the sea, and the salty air makes it all the more complete. A new day. Sunsets as we see below can offer yet more dramatic colors thanks to the clouds. Passing pelicans in formation and other birds contribute to this fleeting moment. And then we have “sand paintings”. Like a meticulously raked Japanese rock garden, but formed here by the hand of nature, a panoply of designs emerges on the dunes. Marked by waves, wind, the changing tide and crabs forming geometric trails, the sand takes on a third dimension. Remains of an old coconut resembling an abandoned nest or long tendrils of a shiny green plant adds to the intrigue of the life of a beach. Below is a very different color palette. This beach near Troncones is marked by sharp outcroppings of ancient igneous volcanic rocks. Stripes of black sand like a zebra reveal the work of the sea on the land. One discovers the remains of lava that once flowed slowly forming eroded volcanic material. Avoiding drenching my camera as the water rose, I photographed as the waves receded. The sand took on a life of its own. Wave after wave made the patterns and the topography change like a dancer’s flowing silk skirt. Feel free to take a look at my previous blog stories: “Casa Azul” and Red!” dealing with a few origins of blue and red color dyes and pigments and the symbolic qualities attributed to these primary colors across a variety of cultures.